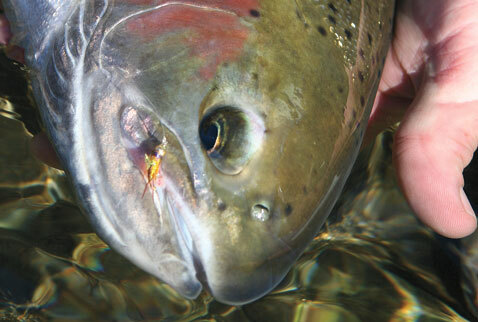 If I had to choose one fly to use for trout anywhere in the world, under any conditions—rivers or stillwaters—it would likely be the venerable Beadhead Prince Nymph. Not only has this wonderful, somewhat quirky-looking pattern saved innumerable days on trout water for me, but I have even landed such unlikely species as king salmon, largemouth bass, mutton snapper, and even bonefish on it! There is just something magic about the Prince's particular combination of materials that fish everywhere seem to find irresistible. So it was some years back, when the flashy Ice Dub product made its debut, that I began searching for ways to subtly incorporate it into nymph patterns, to use its intriguing flash without overpowering flies to the point of spooking fish. One of the first attempts was my Trigger Nymph series, using Ice Dub to emulate the bursting open of the wingpads of emerging insects. The results were encouraging, so I continued to experiment. And while I greatly prefer to strive for originality in my innovative tying, the lure of the Prince Nymph was simply too great in this case, and I decided to give it a makeover, keeping some of the trademark features while incorporating a few new ones of my own. The biots had to remain, of course, otherwise it would cease to be a Prince Nymph at all. I did play with the colors of the tails and wings to suit my preferences, as well as the many individual body colors of the new series. I used Ice Dub for the bodies, but initially they proved ineffective. I suspected they were too bright, so borrowing an idea from many of my Poxyback nymphs, I added a turkey tail carapace over the back, effectively hiding the top 40 to 50 percent of the flash (and effectively imitating the dark dorsal/lighter underbelly color scheme found on the vast majority of the trout's crawling diet). Keeping the rib from the original (albeit wire in place of flat tinsel, to retain the illusion of body segmentation), I eliminated the feather legs of the standard, and added a tuft of Angel Hair to the wingcase area, to suggest emerging wings. Five seasons later, perhaps the greatest surprise has come not from the popularity of this pattern with trout guides, but rather from West Coast and now Great Lakes steelhead anglers, who have made it a top choice in their pursuit of nomadic rainbows. You can tie it in a rainbow of Ice Dub body colors, and it is commercially available in six colors, with purple high on the popularity list for steelhead. Pick a shade that looks good to you, and dead-drift it through your favorite trout or steelhead riffle. I think it'll do wonders for your confidence. Mike Mercer is the Alaska travel specialist at The Fly Shop and author of Creative Fly Tying (Wild River Press, 2005). BEAD: Gold brass, or to preference. TAIL: Dark brown turkey biot. CARAPACE: Mottled golden brown turkey tail. WING BUDS: Electric Banana Angel Hair. REAR COLLAR: Same as body. FORWARD COLLAR: UV Brown Ice Dub. Slide the bead onto the hook. Tie on brown biot tails, wire rib, and the turkey tail body carapace. Dub the body with orange Ice Dub, pull the turkey tail carapace forward and tie down, and wind the rib forward. Tie in the Electric Banana Angel Hair bursting wing buds, then cover the tie-down with more orange Ice Dub. Secure the tan biot wings, one on each side of the body. Dub the forward collar using UV Brown Ice Dub.